Great news shoe lovers, there are two very important dates to mark in your calenders - July 26th (yesterday) and July 31st. First up, let's start with the latter. On Tuesday, July 31st, Rue La La's much anticipated 48-hour Semi-Annual Shoe Sale goes live. Expect to see some great styles from Donald J. Pliner, Bruno Magli, and Charles David as well as other designer favorites. Whether you love to live in flats, heels, wedges, espadrilles, pumps, or sneakers, Rue La La's sale offers hot deals for both men and women. To celebrate this wonderful shoe sale, Rue La La has launched the "Shoe La La" Sweepstakes,” which went live yesterday, Thursday, July 26 at 11:00am EST. 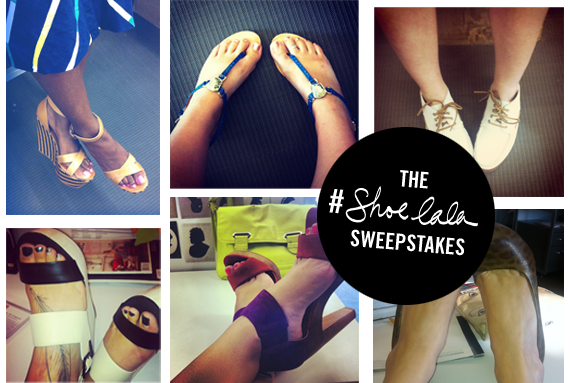 To enter, fans and members are asked to snap photos of their shoes and post them to Rue La La's Pinterest, Instagram, and/or Twitter accounts using the hashtag #ShoeLaLa.Good luck and happy shoe shopping.